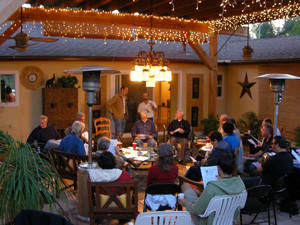 Backyard Skeptics is a 501C3 organization and the largest group of skeptics/agnostics/atheists in Orange County, CA. We hold monthly meetings with interesting speakers as well as movie nights, science-oriented field trips, social dinner nights, music and culture appreciation events and outreach programs such as billboards and ‘coming out’ public presentations. We advocate scientific skepticism and non-belief as a world-view which we believe promotes the well-being of others. We are active in the promotion of science, reason, church-state separation and critical thinking. We meet monthly on the fourth Wednesday or Thursday in a backyard (hence the name) of a home in Villa Park, CA and at Villa Park’s City Hall during the winter months. To join, visit our MEETUP.COM page HERE. We have a voluntary bi-annual $20 membership fee. Our Purpose: To support the non-theistic, scientific skeptic and humanist community with local meetings, potluck parties, food drives for the homeless and other events, and to educate those who wish to know why a humanistic belief is a world-view which improves the human condition. We support all efforts to keep church and state separate, the improvement of civil rights and that climate change is man-made. We enjoy spreading the word that skeptics and non-believers cherish humanistic values over any supernatural superstitions. Through advocating and activism we encourage others to look at their world view with critical thinking skills so they too can feel they can be good without God. We promote the more humanistic philosophy of non-theism as one way to improve reasonable thought and a more peaceful world. Our Goal: To increase social and community activities for the scientific skeptic community, to increase our numbers by showing that being a skeptic or atheist has many advantages over superstitious belief systems and to educate the public through outreach programs. Our goal is not to convert people away from their religious beliefs – we believe they will do that on their own if they ask enough questions and explore the answers from a more rational life-stance. We strongly believe that the world would be a better place without supernatural beliefs and offer those interested a self-guided education to achieve that goal. Our long-term goal is a brick-and-mortar building to be called the Orange County Secular Center in 3 years or less. If you agree with our philosophy please contribute toward our view of a better, more secular nation.